The article below appeared in the April 2019 issue of Planning, the monthly magazine of the American Planning Association. It's worth reading and has a number of useful links. A pdf version (without the links to references) is here. To return to our home page, click here. It describes what other communities (Iowa City!) have achieved. Could we embark on similar programs in Santa Cruz County? As federal commitment wavers, cities leverage local land-use authority and action plans to combat climate change. Portland, Oregon, included the 2015 revision of its Climate Action Plan (its third) in its 2035 Comprehensive Plan, released in December. The resulting synergy helps the city realize significant emissions reductions from the comp plan's land-use and transportation section. 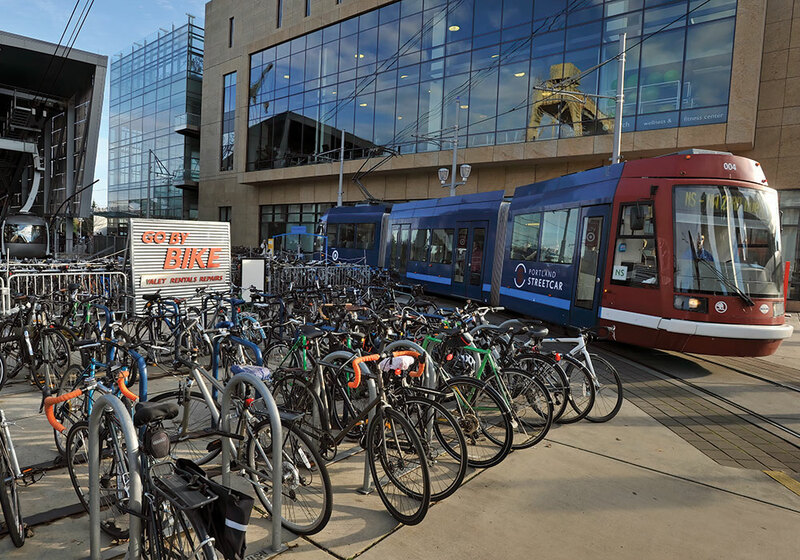 Here, the aerial tram, streetcar, bike parking, and Biketown bike share make car-free commuting easy and accessible at Portland's South Waterfront. Photo by AP-C40. When planner Anne Russett, AICP, heard in April 2017 that Iowa City, Iowa, was creating a climate action and adaptation plan, she knew she had to be a part of it. She had helped create CAPs before and has long had a special interest in leveraging land-use and transportation policies to reduce carbon emissions. At that time, Iowa City already had a decade-long commitment to reduce greenhouse gas emissions in place: In 2007, it signed the Mayors Climate Protection Agreement. In 2008, it joined ICLEI–Local Governments for Sustainability's Cities for Climate Protection Campaign. And in 2016, it signed on to the Compact of Mayors. The city also started tracking its annual greenhouse gas emissions in 2009. 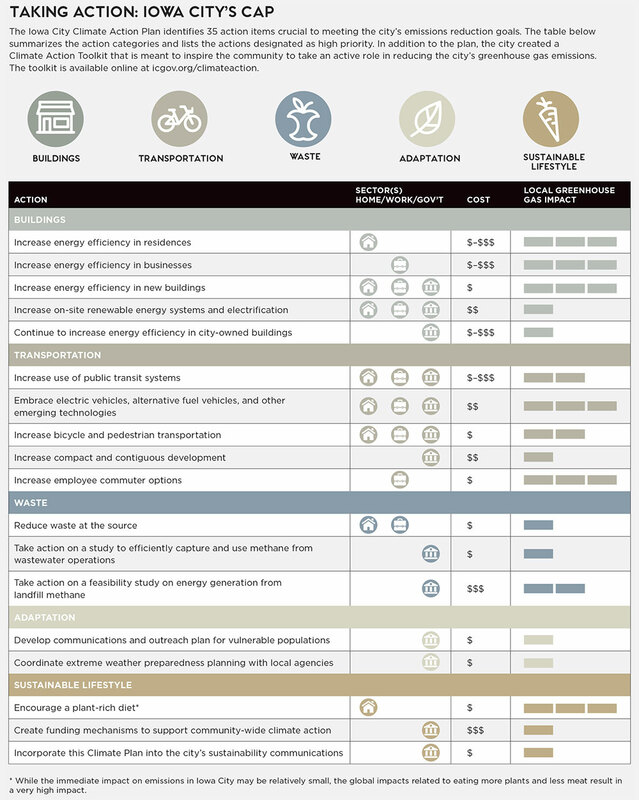 The CAP identifies 35 action items crucial to meeting the city's emissions reduction goals. When the Iowa City Climate Action Plan was adopted in September 2018, the local newspaper noted that its 35 actions — which include increasing public and private energy efficiency, boosting bicycle and pedestrian transportation mode shares, and encouraging compact and contiguous development — will keep the city on track to meet the Paris Agreement's goals for global carbon emissions reduction (despite the fact that the U.S. government was doing its best to wiggle out of it). The overall goal of the CAP is to reduce Iowa City's 2005 level of greenhouse gas emissions by 26 to 28 percent by 2025 and by 80 percent by 2050, targets on par with the U.S.'s original Paris Agreement pledge. It is widely understood that climate change is a global phenomenon, and most of the world is addressing climate change together through United Nations-based agreements. However, the U.S.'s participation has been spotty. That may be because, 20 years ago, the nation was split nearly 50/50 over the existence of climate change. When a January survey showed that 73 percent of Americans now believe the climate is changing in harmful ways, it made headline news. Meanwhile, national policy currently caters to the other 27 percent. While it's difficult to pin any one natural disaster directly on climate change, it is becoming clear that a changing climate is making hurricanes fiercer and flooding and wildfire events more severe and frequent — costing lives and damaging property and infrastructure in the process. Climate change also threatens the ability of cities to provide services their citizens expect, including clear roads, dry homes, and healthy air to breathe. The breadth of this local land-use authority over emissions-producing factors, combined with the difficulty of building broad political consensus, means that when it comes to climate action in the U.S., the smallest political unit — the municipality — has become the most powerful. 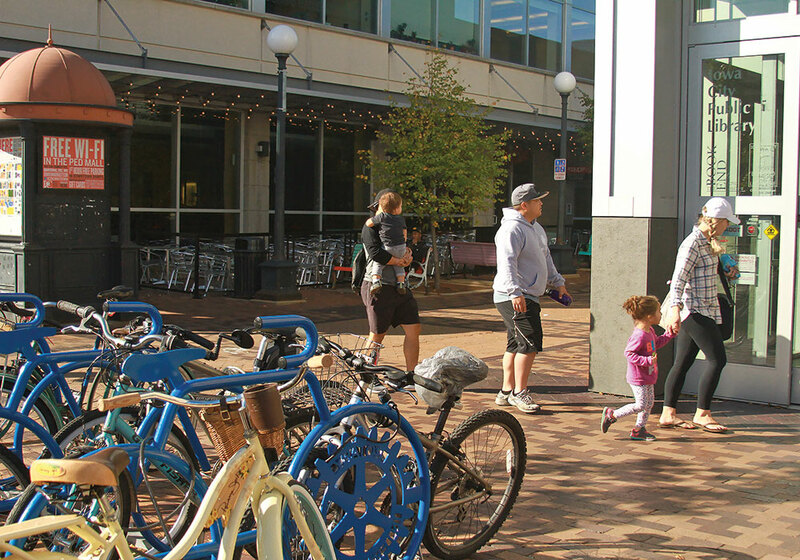 Iowa City's CAP prioritizes bicycle and pedestrian transportation and encourages compact development to meet the Paris Agreement's carbon emissions goals. The steering committee works on the plan (Anne Russett is seated at the far right.) Photo courtesy Iowa City. The steering committee works on the plan (Anne Russett is seated at the far right.) Photo courtesy Iowa City. In the face of federal antipathy on climate change, municipalities across the nation are turning to climate action plans to help them do their part. The nation's first municipal CAP was created in Portland, Oregon, in 1993. California offers its cities incentive to create them as well: If a municipal climate action plan includes greenhouse gas emissions analysis, California cities can qualify for certain state grants. There is no universally agreed-upon definition of a CAP, but typically the term takes the form of a comprehensive, jurisdiction-wide roadmap that outlines specific activities a city or agency will undertake to reduce its emissions. It can be helpful to remember that "climate action" typically refers to the reduction of greenhouse gas emissions, while "climate adaptation" means dealing with the consequences of climate change, such as flooding, drought, or hot weather. Many climate action plans address both. In most places, however, climate action plans are a general expression of policy. Just like many other kinds of plans that cities make — energy plans, conservation plans, transportation plans — they don't have legal power until further steps are taken. Along the path to reducing carbon emissions, the step of creating a CAP falls somewhere in the middle. The process generally starts when cities sign a pledge (such as the 2007 Mayors Climate Protection Agreement). Next come actions to reduce emissions on city property. Then comes the integration of related policies into a comprehensive plan. The next — and key — step, says Michael Burger, executive director of Columbia University's Sabin Center for Climate Change Law, is to make them legally relevant. "Many climate plans out there are not baked into the necessary codes and planning requirements for local governments. That needs to happen," he says. In other words, a CAP gets teeth only when cities develop and enact zoning and building ordinances that will help them reach their pledge targets. For example, local codes might specify requirements for new construction to incorporate floodplain elevation projections, green building features, or cool roofs into their development plans. 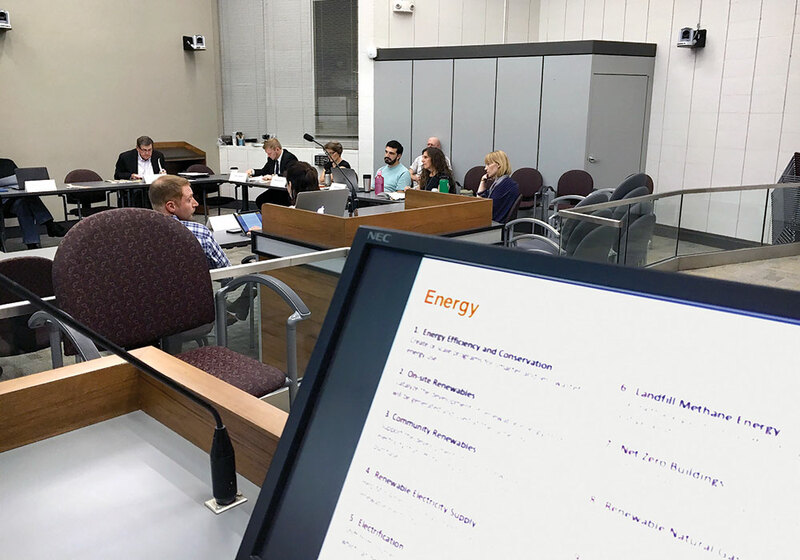 The Iowa City Climate Action Plan identifies 35 action items crucial to meeting the city's emissions reduction goals. The table below summarizes the action categories and lists the actions designated as high priority. In addition to the plan, the city created a Climate Action Toolkit that is meant to inspire the community to take an active role in reducing the city's greenhouse gas emissions. The toolkit is available online. * While the immediate impact on emissions in Iowa City may be relatively small, the global impacts related to eating more plants and less meat result in a very high impact. Twelve years ago, William Needelman was a senior planner for Portland, Maine. He was asked to join nine city staffers in creating a climate action plan at the direction of the city council. At first, there was little need for Needelman's skills as a planner. "It was all about carbon mitigation, and the first step was carbon assessment, which doesn't involve planning," he says. But Needelman knew he had an important role. "Planners live in abstract worlds on a regular basis," he says. "They plan for a future with uncertain outcomes. Having a planner at the table lends the group that language of dealing with uncertainty." Once a climate action plan gets into land-use ordinances, Needelman notes, planners are back in familiar territory. For Portland, this took the form of a green building ordinance in the city's land-use code. Back in Iowa City, being on the steering committee was a different experience for Russett. "Usually as a planner, you are the one doing the outreach and creating the policy," she says. As a steering committee member, your role is as a stakeholder, not staff. She adjusted to the new perspective. "Part of me wanted to get more involved, but part of me realized that it was in good hands and I had a different role to play." She used the opportunity to introduce equity into the steering committee's discussions. "It's important for planners to look at all potential climate actions through the lens of equity," Russett adds. Some emissions-related strategies, like expanding public transportation or lowering transportation fees, can benefit underresourced communities. Negative impacts on these communities are harder to give examples of, she says, because they are rarely done on purpose. Digging deep into her imagination, she says that the need for more air conditioners for children and the elderly in increasing heat could be at odds with a policy to reduce energy use. "We don't want to harm segments of our community to reduce emissions," she says. All in all, the perspective that planners bring to the process is unique and valuable. 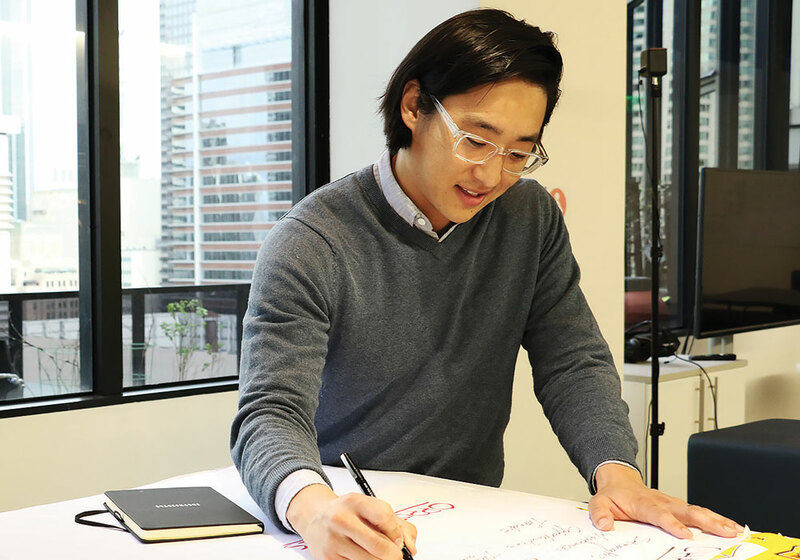 "Planners have a background in processes that are inclusive and evidence based," says Christopher Rhie, an urban planner and sustainability strategist for BuroHappold Engineering. "They can identify the co-benefits of reducing greenhouse gas emissions, such as improving public health, promoting complete neighborhoods, and encouraging smart growth." 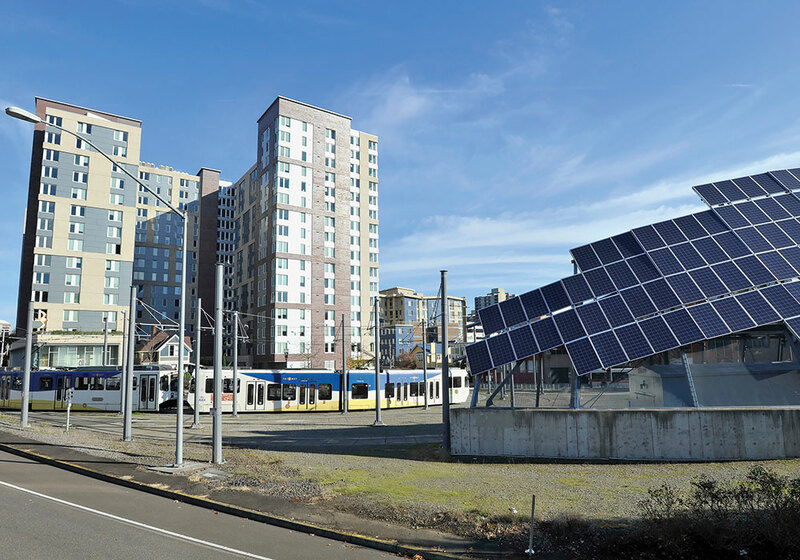 This solar installation is the largest in downtown Portland, Oregon. It generates more than 64,000 hours of electricity per year with solar panels manufactured and installed by local companies. Photo by AP-C40. Municipalities are not the only governmental jurisdictions to create climate action plans in the absence of a federal-level policy. According to the Georgetown Climate Center, 16 states have finalized state-led climate adaptation plans; seven more are in the process. States with climate plans tend to be on the coasts, perhaps because those states tend to be more liberal. Or it may be because that's where citizens are already seeing and acknowledging climate change's impacts. That's as true in the hurricane-prone swing state of Florida as it is in the politically uncharacterizable state of Maine. "When you see nuisance flooding becoming more common, it's hard not to pay attention," says Troy Moon, Portland, Maine's sustainability coordinator. "Climate change is more in our faces than it may be in cities that are not on the coast." States with climate plans tend to have cities with climate plans, likely for similar reasons. California is on the third version of its state climate action plan. Dozens of its cities have municipal plans, which are a doorway to state funding for climate projects. Karalee Browne, sustainable communities program manager for the Institute for Local Government, believes that the 28 different state grant programs now funded through its carbon cap-and-trade program set California apart. "Local governments often have these great plans but lack the funding to implement them. State grants for transit, affordable housing, urban greening, and sustainable communities are creating opportunities for local governments to take action," Browne says. But it isn't all good news. Recently, the California Air Resources Board released a greenhouse emissions report that said, overall, California is ahead of its emissions reduction targets for 2020. But an increase in individual vehicle use means the state is not on pace to hit future targets. State laws can affect municipal climate action in other ways. For example, Massachusetts has a statewide building code that generally prohibits local municipalities from requiring more stringent local standards, says Barbara Landau, an environmental lawyer and planner with Noble, Wickersham & Heart LLP, a law firm specializing in design, construction, and environmental and land-use practices. To get around that, some Massachusetts municipalities have used the special permit zoning process or performance standards for specific areas, such as waterfronts, to encourage greater flood protection ordinarily provided under the building code. Certain portions of the Alewife neighborhood of Cambridge are under a special permit, she notes. Cambridge has been successful in getting builders to elevate first floors in the Alewife neighborhood on an ad-hoc basis, Landau says. The new zoning is a way to formalize that, particularly since it can't be done through a building code. LA County hired BuroHappold Engineering to lead the two-year process of creating a new countywide sustainability plan. Christopher Rhie, a BuroHappold planner and sustainability strategist, plots the course. Photo courtesy BuroHappold Engineering. LA County hired BuroHappold Engineering to lead the two-year process of creating a new countywide sustainability plan. Community members identify priorities. Photo courtesy LA County. After cities take action alone, their next step is often to plan together with their neighbors for an even bigger impact. About two years ago, when Gary Gero, the chief sustainability officer of Los Angeles County, interviewed for his current job, he said he wanted to address sustainability issues on a regional scale. "For example," he says, "heat islands. You can't address that in a patchwork." Luckily, the Los Angeles County Board of Supervisors believed that by pulling the county's 88 cities together, all could benefit, Gero says. The county is creating a new Community Climate Action Plan and Our County, a county-wide sustainability plan. "There are a lot of specific actions coming out of our climate plan," Gero says. For example, 31 jurisdictions created a community energy program. Ten of those jurisdictions now have 100 percent renewable energy for residents and businesses. The cool roofs ordinance is close to Gero's heart. It's one of the newest and strictest local ordinances mandating reflective roofing material, he says. The model ordinance will make it easier for roofers who work throughout the county. "They can focus on one standard, instead of trying to figure out 88 different standards." The county is working to align its plans with Los Angeles's current comprehensive planning process. "If we can get the city of Los Angeles to align with these goals, then we have nearly half the county already," Gero says. He expects the county's initial policies will be made public this month. California is not alone in taking regional action. Portland, Maine, has just begun the process of working with neighboring South Portland to create a climate adaptation plan that will help both cities reduce their carbon emissions by 80 percent by 2050. MetroBoston is a group of 14 Boston-area communities collaborating on climate vulnerability assessments. Portland, Oregon, has always been a leader on climate action on the municipal level. It started with its first-in-the-nation municipal climate action plan, created in 1993. The city included the plan's 2015 revision (its third) in its 2035 Comprehensive Plan, which was released last December. "The synergy between the climate action plan and comprehensive plan is that a big chunk of the emissions reduction is coming from the land-use and transportation section of the comprehensive plan," says Tom Armstrong, supervising planner with Portland's Bureau of Planning and Sustainability. In 2015, it took another leap in local action against climate change when the city council passed a resolution that refused to amend zoning regulations to allow a proposed propane terminal to be built. The same resolution asked the city's planning department to create a zoning ordinance that would reduce the city's risk of a fossil fuel disaster. Adopted in 2016, the zoning ordinance was another climate first for the Oregon city. Specifically, it prohibits the construction of new fossil fuel terminals with a capacity exceeding two million gallons and caps the expansion of existing terminals. "Innovative solutions like banning fossil fuel infrastructure, fracking, or fossil fuel development within city limits raise more novel legal issues," Burger says. Sure enough, the Columbia Pacific Building Trades Council, Western States Petroleum Association, and the Portland Business Alliance challenged the ordinance in court. The state Land Use Board of Appeals ruled against the ordinance, but a higher court, the Oregon Court of Appeals, backed the ordinance's validity while upholding some of the lower court's objections. That means the city is back to work. "We have to do some minor fixes to readopt the ordinance, per the lower court's ruling," Armstrong says. Already, other jurisdictions are following suit. In late January, the county council in King County, Washington (home to Seattle), approved a six-month moratorium on building fossil fuel infrastructure in unincorporated portions of the county. Not every community has the resources to initiate climate solutions at the local level, but not every community needs them. Browne observes that in California, wealthy communities like Santa Monica, Los Angeles, San Francisco, San Rafael, and Palo Alto have taken the lead on climate change. Those climate action leaders break new ground for other cities with fewer resources. The Institute for Local Government highlights some of California's most innovative climate change actions with its Beacon Awards. The Institute's list of interim winners and annual champions is a good resource for municipalities looking for ideas, Browne says. Christopher Rhie says there are learning networks and commitments for cities at every level. C40 is one well-known climate network among the world's largest cities, but there are also opportunities for smaller jurisdictions, such as the Global Covenant of Mayors for Climate and Energy, ICLEI USA, the Urban Sustainability Directors Network, and regional entities such as the Los Angeles Regional Collaborative and the Metropolitan Mayors Climate Mitigation Commitment in Greater Boston. How can the planning community prepare for a future where they will be at the center of climate action planning? Rhie would like to see all land-use planners get training in the basic mechanics of reducing greenhouse gas emissions. And he'd like to see planners ask the big-picture questions about the impacts of planning decisions on greenhouse gas emissions. "They occur for the lifetime of the building project or neighborhood development," he says, "and will have ripple effects into the future." Needelman, who is now Portland, Maine's waterfront coordinator, says, "Given the choice between creating a climate action plan and incorporating climate change into every plan, choose the latter. When every coastal community incorporates sea-level rise into every plan, when communities incorporate carbon mitigation into a broad spectrum of community processes, then we will have accomplished something." Madeline Bodin is a freelance journalist and a frequent contributor to Planning. 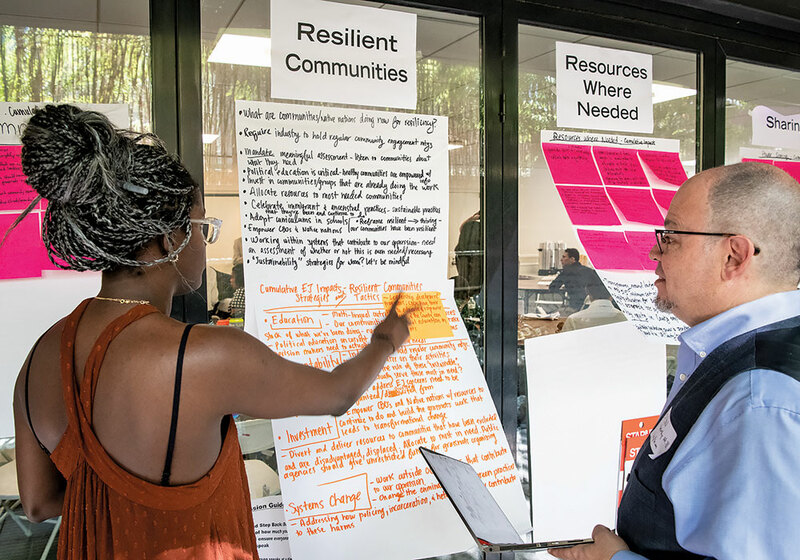 APA Learn: Building Resilience: Cities Taking Action — New Orleans, South Florida, and the Virginia Tidewater region are at the forefront of planning for climate-change impacts. Learn how planners are developing and putting climate-resilience plans into action — and what they are learning and modifying as they move forward. State and Local Adaptation Plans: The Georgetown Climate Center's interactive map shows how states and communities around the country have begun to prepare for a changing climate. CAP Progress in Portland, Oregon: A report on the Portland and Multnomah County 2015 CAP identifies more than 170 actions that will be completed or under way in 2020. LA County Community Climate Action Plan: LA County's CCAP tallies current GHG levels and documents ways to mitigate and avoid them. The CCAP will be part of the new general plan.